The best graduation gift for under $15 that covers all the bases for new professionals. Corporate Ladder 101: The Perfect College Graduation Gift! This is the book that picks up on the practical side of the business world not covered in the formal education of colleges and universities. 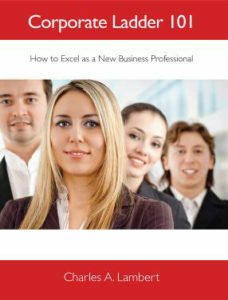 It is a roadmap for professional and personal development and gives new professionals the tools needed to create an image and a reputation that will get them ahead and set them apart from their peers. If you are looking for graduation gift ideas, you've come to the right place. The wisdom in Corporate Ladder 101 is one of the best college graduation gifts you can give to your son or daughter, niece or nephew, friend or colleague. In addition to being among some of the great graduation gifts available, it should also be included in every corporation's new graduate on-boarding program. As an HR professional, I believe Corporate Ladder 101 should be a MUST READ for any employer’s ‘on-boarding program’ with college recruits. If you're going into the corporate world, Corporate Ladder 101 needs to be a part of every university's career preparation course curriculum. As a therapist in a university setting... [this] book is vital for the millennial generation. If you’re going into the corporate world, then this book is a must read. This is what they don’t teach you at school. Corporate Ladder 101 is a great book for new graduates and will share with some of the people I work with.